The Open Data Institute (ODI) launched recently the key findings of its data trust research programme and at high-profile event at the Royal Society of Arts, attended by Head of the UK Government Office for Artificial Intelligence (AI), Sana Khareghani and Theo Blackwell, London’s Chief Digital Officer. The research programme, which concluded in March 2019, is the first in-depth study on the role of data trusts. 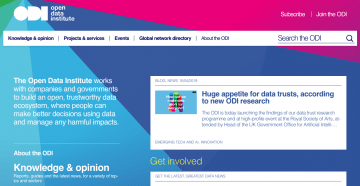 The Open Data Institute’s research found that there is huge demand from private, public and third sector organisations in countries around the world to explore data trusts. Whilst organisations have different ideas about what data trusts could do, they are nevertheless enthusiastic and eager to find ways of sharing data whilst retaining trust, and still deriving benefits for themselves and others. WILDLABS is the first global, open online community dedicated to conservation technology. The WILDLABS community connects field based conservationists with tech experts around the world. Together, its members share information, ideas, tools and resources to discover and implement technology-enabled solutions to some of the biggest conservation challenges facing our planet. WILDLABS Tech Hub, with funding from the Foreign and Commonwealth Office (FCO), is working to bring data providers and machine learning developers together to create technological and data driven solutions for tackling the illegal wildlife trade. The Digital Competition Expert Panel, chaired by former Chief Economist to President Obama, Professor Jason Furman, made recommendations for changes to the UK’s competition framework to face the economic challenges posed by digital markets, in the UK and internationally, in its report Unlocking Digital Competition in March 2019. The Open Data Institute was co-founded in 2012 by the inventor of the web Sir Tim Berners-Lee and artificial intelligence expert Sir Nigel Shadbolt to show the value of data, and to advocate for the innovative use of data to affect positive change across the globe. We’re an independent, non-profit, non-partisan company headquartered in London, with an international reach. We work with companies and governments to build a world where data works for everyone.